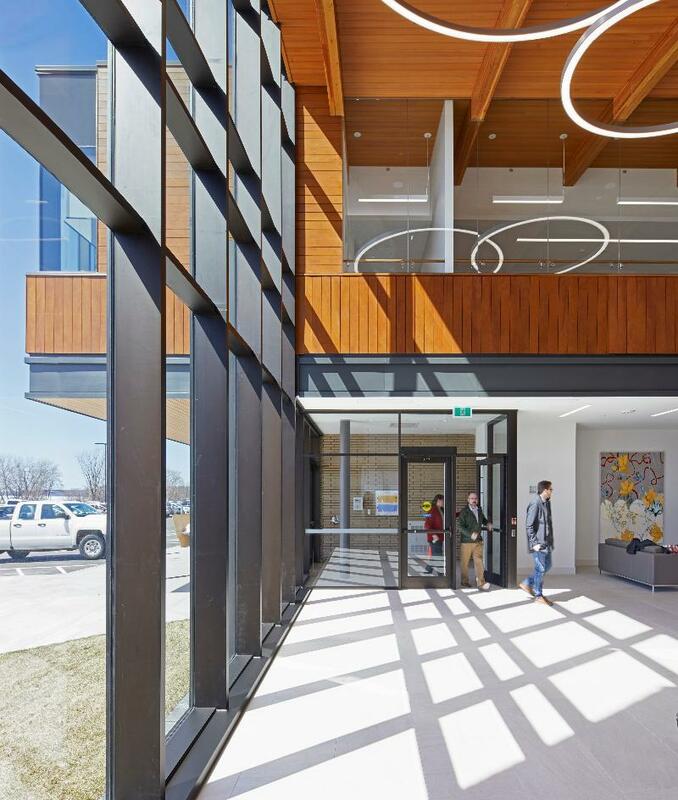 Under the guiding principle that “movement is life,” Mitchell Jensen Architects Inc. and Carlyle Design Associates recently completed the North Bay Parry Sound District Health Unit. 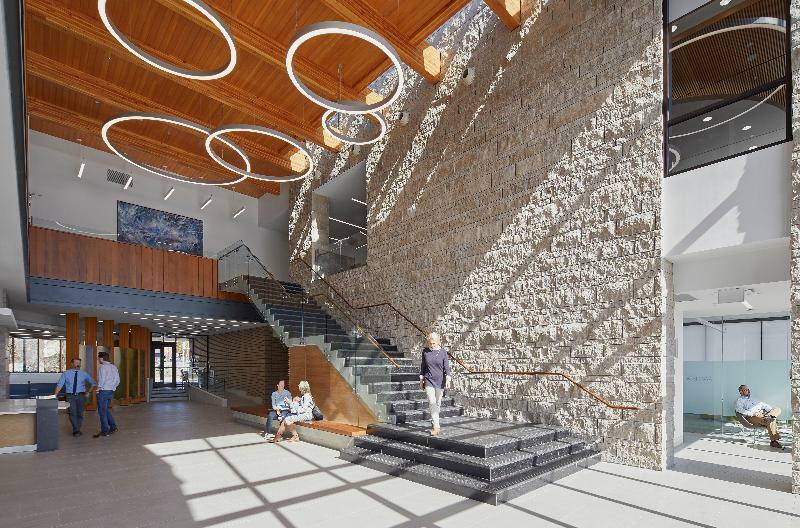 The 150-person, 58,000-sq.-ft. facility works to promote health and prepare for emergency situations in 31 municipalities across northern Ontario — leading to a carefully designed building that promotes ease of accessibility and circulation for employees and the public alike. 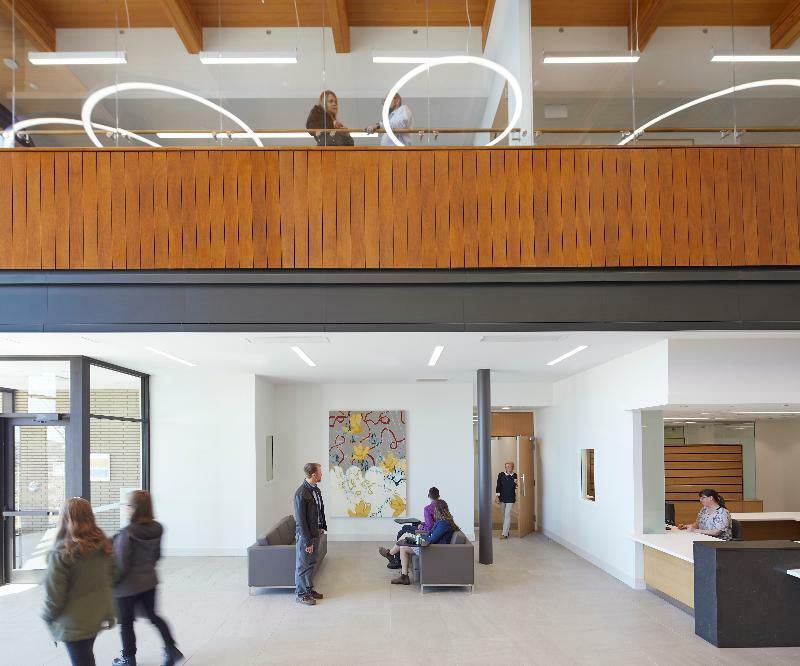 On the exterior, the building sits on a brownfield site that is centrally located in downtown North Bay in order to best serve clients from different parts of town. Nearby bike routes and pedestrian paths contribute to active transportation to and from the Health Unit, whereas easy access to Lake Nipissing and outdoor recreation areas keep within the facility’s objective to promote healthy lifestyles. 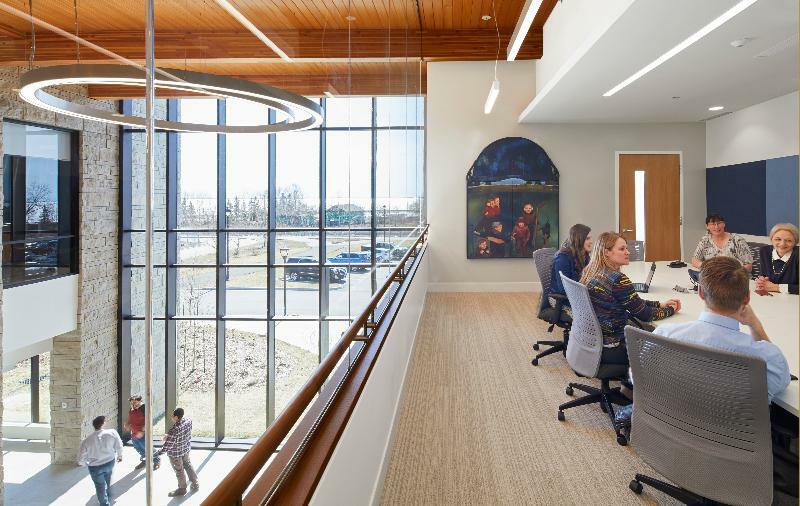 Expansive glazing and views of landscape help to calm stress and to aid wayfinding, and is further reinforced by materials including abundant wood and natural stone, particularly in the transparent two-story lobby. Along the street façade, a Douglas fir curtain wall signals a creative venture for the architects. “It’s a new product for us,” says Mitchell. 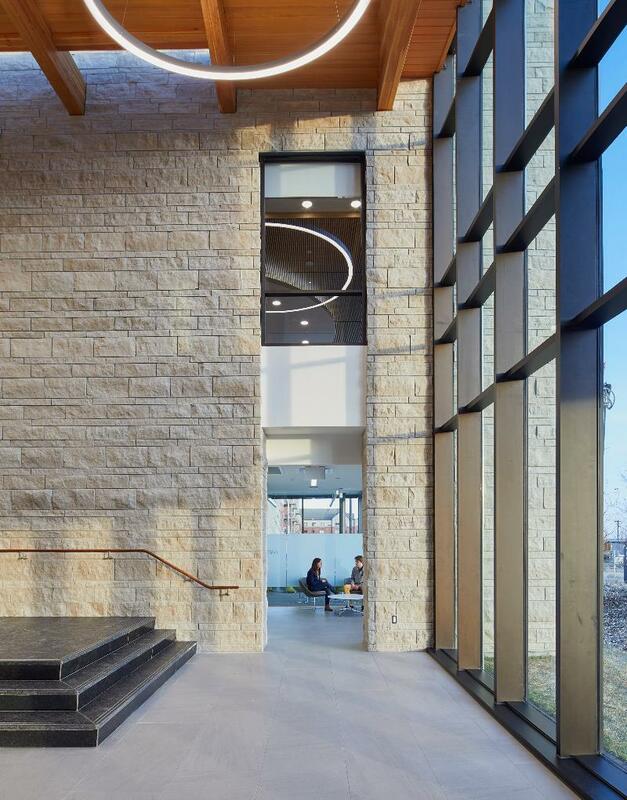 “It’s a proprietary system that uses glue-laminated timber instead of aluminum to support the glazing of the curtain wall system.” A rough-cut Adair limestone wall in the lobby complements this natural exterior, and is paired with porcelain tile floors, granite and concrete stairs, teakwood benches and white oak accents throughout. Finally, at the heart of the facility, the design seeks to inspire ownership and pride. 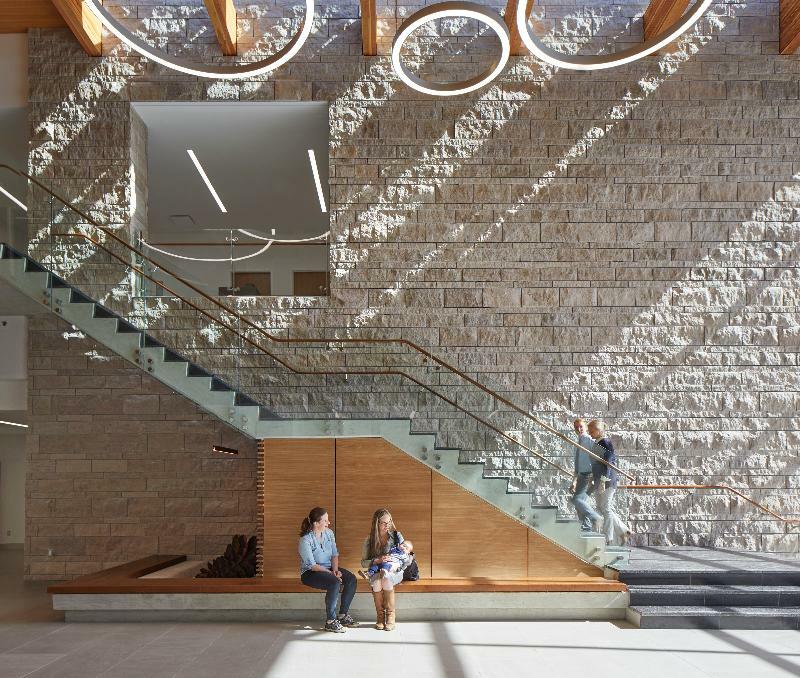 “I’m a firm believer that quality public buildings are a great reflection of a healthy community, and I hope community members embrace this one as their own,” says Mitchell. 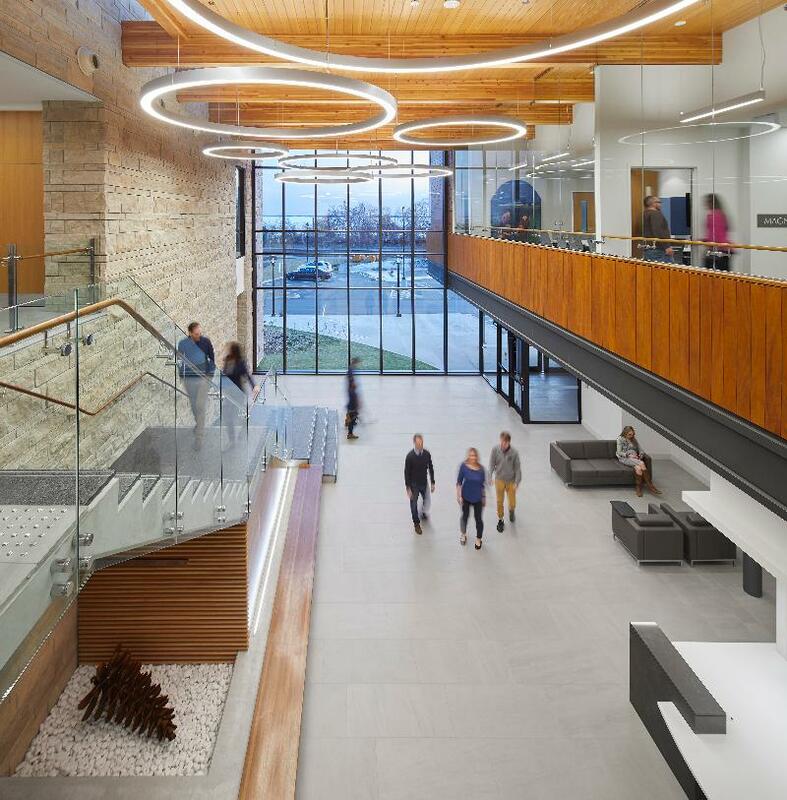 From its movement to its materials, the facility is committed to promoting and advancing the health of the community it serves. Adair Limestone Marble: Ariscraft International Inc.